It was Guy Fawkes night in the year 1996 when sporadic fireworks were noticed on Islamabad’s horizon. Some kids in Halloween make up were doing the rounds celebrating. Sitting in Prime Minister House with my wife, on hearing a blast of fire works I reminded the Prime Minister that it was Guy Fawkes night when in the year 1605 Catholic terrorist Guy Fawkes with his seven comrades plotted to blow up the British House of Lords and kill King James. By the evening of 5th November she was allowed to see a limited number of visitors on clearance of the military. Amna, Salim and I were among the few who had rushed to see if she is OK. Seeing me she again advised me to go back to London. There was no news where and how AAZ was kept. When alone we discussed what could possibly be in store for her. I found her hurt over Farooq’s anti-democratic step. Looking back, I was of the view that it was a colossal misjudgement to make him president. I reminded her that he had given a glimpse of his shaky loyalty by his masterly inactivity following Bhutto Sahib’s arrest by General Ziaul Haq. She agreed. She confessed she should have suspected him when DG ISI Lt Gen Javed Ashraf Qazi strongly recommended his presidency. I believe — especially in Pakistan — that intelligence agencies have their Quislings and Trojan horses in every political party to use them at a critical juncture when they want to subvert a government from within. Being a PM from Sindh like her father Shaheed Zulfikar Ali Bhutto and the shabby treatment given to her following her ouster in 1990 — I naturally had serious apprehension for her. I told her “instead of making arrangements for me to leave the country, you should think of yourself too”. Brave lady that she was, she shrugged her shoulders — “Wajid Bhai, we have to face what has to come. We can’t leave Quaid and Bhutto Shaheed’s democratic mission half way”. As predicted by her I was arrested in mid-November and tortured for months to force me to commit perjury against her. FIA failed and I remained steadfast. Nawaz Sharif won election and as prime minister one expected he would be fair. Instead his Gestapo Chief Saifur Rehman-besides keeping me in and torturing me for days went after Bibi and Asif like blood thirsty hound to the extent a senior judge was forced by him to convict both in April 1999. Power drunk Leghari too as president and Supreme Commander of armed forces—misconceived himself to be a victor with an assured long innings. With powers under 58-2-B he had decided to play games with Nawaz Sharif too. He did not realise that he was used by the invisible players. He wanted Nawaz to have simple majority, they got him two/third. After browbeating CJP home, MNS removed 8th Amendment and forced Farooq to resign on threat of impeachment. Soon came Shariah Bill, Kargil misadventure and GPM’s sack that rebounded on him by yet another institutional decision, taking him lock, stock and barrel to comforts of Saroor Palace only to return him home, courtesy Benazir Bhutto. 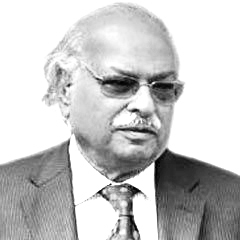 Farooq Leghari and Justice Sajjad Ali Shah’s pathetic ending was much more similar to the fate of General ZiaulHaq, Justice Mushtaq, Supreme Court judges who ordered hanging of Shaheed Zulfikar Ali Bhutto and now critically ill General Pervez Musharraf, main accused in Benazir Bhutto and Nawab Akbar Bugti murder cases. Courts can play foul, there could be delay but justice is never denied from the Lord above.